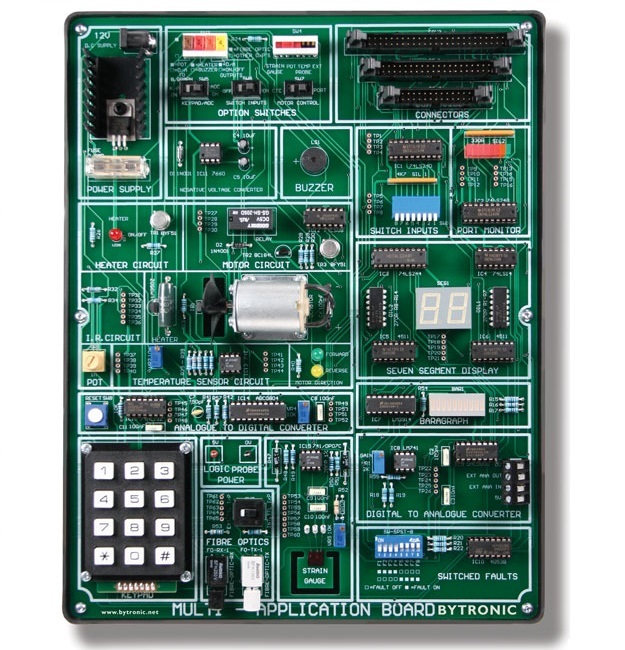 The Multi Applications Board (MAB) contains a variety of experiments on one board and is ideal for learning how to interface a PC or Microcontroller to applications. The techniques of controlling data transmission, keyboard entry, digital sound production, D.C. motors, heaters, and visual displays can be controlled using a PC with a programming language, the MAB can also be used as target for a microcontroller. This involve the fundamentals of microprocessor or computer programming, such as decision making, D to A and A to D conversion, open and closed loop control, creating delay loops, using subroutines and event counting. The MAB Primary components are: a 12V d.c. motor, this is used for closed-loop control to drive a fan which cools a heater/resistor to a set temperature. Several other elements are on the MAB these include a Piezo buzzer, TTL monitor, a bank of logic switches, a logic probe power point, a strain gauge and amplifier, a bar-graph and a seven segment display, switched faults and a potentiometer that can be used as an analogue input.